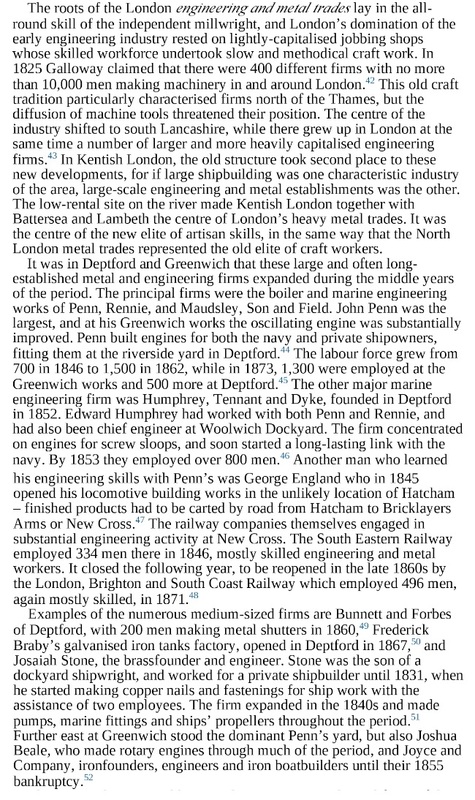 Bunnett and Corpe was a 19th century engineering firm with a factory in New Cross Road. 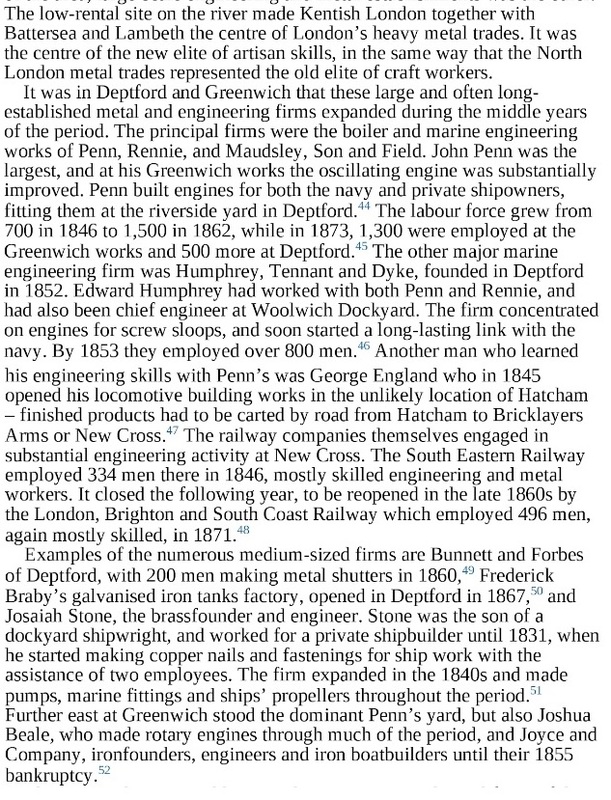 The Post Office London Directory, 1843, described them as 'engineers and patentees of the concentric steam engine, and of revolving iron shutters' with an office at 26 Lombard Street and factory in New Cross. 'It is with regret that we record that a “strike" has taken place in the well-known, and for very many years past, well conducted firm (now a limited liability company) of Messrs. Bunnett and Corpe, New Cross Road. Under the new management, a certain code of rules has been adopted, hitherto unknown at the works (although in vogue at a neighbouring firm), and which rules were felt to be repugnant to and subversive of the interests of the workmen, the principal objection to which is that any defect in the work done is to be made good out of the wages of the person employed. A general meeting of the men employed was held on Tuesday, at which the new roles were generally condemned, and as the company refuses to yield as regards the points in dispute, a “turn out” has taken place, and some 150 workmen remain idle'. 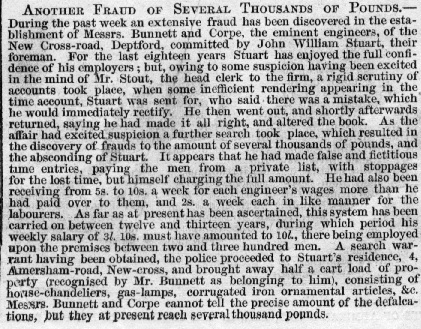 Interestingly a decade before, the firm's foreman at the New Cross Road factory was accused of a fraud that involved him personally pocketing deductions from workers' wages. John William Stuart had been working there for 18 years for at least 12 of which he had been on the make. It seems he was in control of the firm's payroll, and received a sum each week to pay the workers at their full wage. But many of the workers had payments deducted for stoppages. So with some creative bookkeeping he was able to siphon of the difference between what the 200-300 workers were actually paid, and the wage budget provided by the company. No doubt this also gave him an incentive as manager to maximise the deductions from worker's wages. On top of that he actually paid the workers a lower wage than he was declaring to the company owners. He was also said to have 'been in the habit ofemploying the men and material of the firm in the construction of lathes, &c., and disposing of them for his own individual benefit. The most heartless portion of the fraud, however, is the receipt by Stuart of a sovereign from Mr. Bunnett for an injured carman, which was never paid ove. A search warrant having been obtained, the police proceeded to Stuart's residence, 4, Amersham-road, New-cross, and brought away half a cart load of property (recognised by Mr. Bunnett as belonging to him), consisting of house chandeliers, gas lamps, corrugated iron ornamental articles (including two aquaria well stocked with fish), manufactured from the material of his employers, with which the house was decorated. (London Morning Post, Tuesday, November 18, 1856).